Abstract: KT3 Ultra2-BR has all the goodies we've come to expect - onboard USB 2.0, 5.1 audio, five PCI slots, three DIMM's and now even Bluetooth! 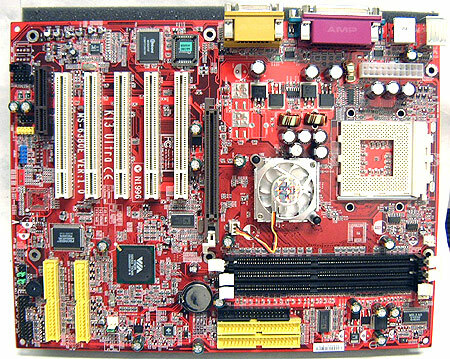 We really liked the original KT3 Ultra-ARU mainboard we reviewed earlier in the year. According to the specs the only difference between the two boards is Bluetooth compatibility, so what else is exactly new? MSI have gone with red PCB's for all their flagship motherboards, and I must say they do look pretty good in the right light. These days, style seems just as important as performance! The KT3 Ultra2-BR has all the goodies we've come to expect out of a motherboard - onboard USB 2.0, 5.1 audio (software codec), five PCI slots, three DIMM's and now even Bluetooth! Looking at the KT3 Ultra2-BR motherboard we can see that it uses the same layout as the original KT3 Ultra and we're not at all surprised. It was a good layout then, and it still is now. Basically all MSI did was replace the old VT8233 southbridge and remove the NEC USB 2.0 chipset on the original KT3 Ultra and replace them with the new USB 2.0 compatible VIA VT8235 southbridge and bluetooth adaptors (basically a USB 2.0 header). The KT3 Ultra2-BR still has some other goodies like onboard 5.1 audio, and onboard Ultra/133 IDE RAID. Of course since the KT3 Ultra2-BR does inherit the old layout it still has the same problems that plagued the old motherboard. The fan header is way too close to the to the Clear CMOS jumper. Also, my personal pet peeve is this little capacitor which sits closely to the AGP lock. Even though my fingers are small, every time I unlock the AGP card I'd nudge it a bit which is very nerve racking. Since consumer CNR devices are almost non existent, it would have been nice to instead have a sixth PCI slot... where the CNR slot sits. With an integrated LAN controller in the southbridge I often wonder why manufacturers don't use take advantage of it more. Socket Mounting Holes: 5mm Ødia. Note: Approx. 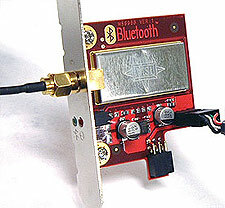 measurements are made from the edge of the socket (not the clips) to the closest obstacle taller than the ZIF socket itself. The socket is 51mm across, and 62mm from top to bottom. As we can see, MSI has graciously cleared the area next to the CPU socket of capacitors and other things that could get in the way in installing larger heatsinks on those spicy AthlonXP processors. We wish more mainboards would be designed in a friendly way towards larger heatsinks. 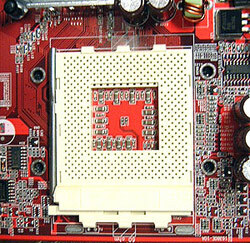 The holes around the socket are a rare thing now, as AMD has officially dropped the spec from its list of requirements. Newer mainboards will not have those four holes anymore. The only complaint we have here about the socket on the KT3 Ultra2-BR is just how close it is to the top of the mainboard. In cases where there is not a lot of space between the powersupply and the motherboard tray this kind of placement makes it really, really difficult to install the heatsink without first having to remove the powersupply. If you have a heatsink which requires the use of a flat head screw driver, and that kind of case it is just about impossible to properly install the heatsink. Rotate the socket 90 degrees and all those problems vanish... but we all know trace lines are not that easy to change so I really recommend removing the mainboard from the case to install the heatsink, or pulling out the powersupply if you have a case that butts the two up close together. One of the guys in the lab tried to get around doing that and accidentally fried an AthlonXP. At least on the chipset cooling side we were happy to see a nice active cooling heatsink on the AIA KT333 northbridge. It gets somewhat hot during use, so this heatsink probably helps stability quite a lot.